Cyclooxygenases (COXs) catalyze the rate-limiting step in the production of prostaglandins, bioactive compounds involved in processes such as fever and sensitivity to pain, and are the target of aspirin-like drugs. COX genes have been cloned from coral, tunicates and vertebrates, and in all the phyla where they are found, there are two genes encoding two COX isoenzymes; it is unclear whether these genes arose from an early single duplication event or from multiple independent duplications in evolution. The intron-exon arrangement of COX genes is completely conserved in vertebrates and mostly conserved in all species. Exon boundaries largely define the four functional domains of the encoded protein: the amino-terminal hydrophobic signal peptide, the dimerization domain, the membrane-binding domain, and the catalytic domain. The catalytic domain of each enzyme contains distinct peroxidase and cyclooxygenase active sites; COXs are classified as members of the myeloperoxidase family. All COXs are homodimers and monotopic membrane proteins (inserted into only one leaflet of the membrane), and they appear to be targeted to the lumenal membrane of the endoplasmic reticulum, where they are N-glycosylated. In mammals, the two COX genes encode a constitutive isoenzyme (COX-1) and an inducible isoenzyme (COX-2); both are of significant pharmacological importance. Cyclooxygenases (COXs), also known as prostaglandin H synthases or prostaglandin endoperoxide synthases (E.C. 1.14.99.1), are fatty-acid oxygenases of the myeloperoxidase superfamily that are most closely related to the pathogen-inducible oxidases and linoleate diol synthases of plants and fungi . The purification of COX-1 (then called simply COX) from sheep  and bovine  seminal vesicles in 1976 led to the cloning of the COX-1 gene in 1988 [4–6]. For many years, it was thought that the constitutively active COX-1 protein was the only cyclooxygenase in eukaryotic cells, but in 1991 a second, inducible enzyme was identified through studies of cell division; this second enzyme is now called COX-2 [7, 8]. The structure of the human COX-1 and COX-2 genes are shown in Figure 1a, and the properties of COX-1 and COX-2 and the genes encoding them are compared in Table 1. Primary structures of COX genes and COX proteins. (a) Schematic representation of human COX-1 and COX-2 genes and the mRNAs they encode (shown as white bars below the genes). Black boxes in the genes and white boxes in the mRNAs denote exons; numbers above each gene are exon numbers while numbers within the white boxes indicate the size of each exon in nucleotides; single lines in the genes indicate introns and untranslated regions of first and last exons (the latter being shown as gray boxes in the mRNAs). Adapted from . (b) Schematic representation of human COX proteins (all known vertebrate proteins have the same general arrangement). Numbers denote amino-acid residues; the exons encoding each domain are shown on bars below the proteins; important residues are indicated as shown in the key (and with letters in the single-letter amino-acid code, with a subscript number indicating the residue number). Sp, signal peptide; Dm, dimerization domain; EG; epidermal growth factor domain; Mb, membrane-binding domain; Cat, catalytic domain. Information from [10,13,35]. *Abbreviations: CRE, cyclic AMP response element; GATA-1, binding site containing GATA sequence bound by the GATA 1 transcription factor; GRE, glucocorticoid-response element; SSRE, shear-stress response element; other abbreviations denote the transcription factors bound by the regulatory elements shown: AP-2, activator protein 2; C/EBP, CCAAT/enhancer-binding protein; NF-IL6, nuclear factor for interleukin 6; NFκB, nuclear factor κB; PEA-3, polyoma enhancer activator; SP-1, transcription factor SP-1. All vertebrates investigated, including cartilaginous fishes, bony fishes, birds, and mammals, have two COX genes: one encoding the constitutive COX-1 and another the inducible COX-2. COX-1 and COX-2 share approximately 60-65% amino-acid identity with each other; COX-1 orthologs (without the signal peptide) share approximately 70-95% amino-acid identity across vertebrate species and COX-2 orthologs share 70-90%. Additionally, coral (of the phylum Cnidaria) and sea squirt (ascidian) each have two COX genes, which may have arisen from gene-duplication events independent from those that produced vertebrate COX-1 and COX-2 . It is clear that the vertebrate, coral and ascidian COX genes all descend from a common ancestor. Intron-exon junctions are highly conserved in all species, with a few notable exceptions: the vertebrate COX-1 genes contain an extra intron (intron 1), and the ascidian and coral genes have extra introns or lack some exons in the regions that encode exons 6, 7 or 11 in vertebrate COX-1 . The exon structures of COX genes largely reflect the domains encoded by the proteins (Figure 1b). The structure of human cyclooxygenase genes and their expression and regulation have been reviewed elsewhere . COX genes have not been found in insects, unicellular organisms, or plants, although prostaglandins, their products, have been found in some of these organisms . Recently, an enzyme that catalyzes the synthesis of prostaglandin E2 from arachidonic acid (the substrate of COXs) was cloned from the protozoan Entamoeba histolytica. This enzyme shows no clear structural similarity to COXs, suggesting that alternative evolutionary paths to prostaglandin synthesis have evolved in some organisms . COXs are all close to 600 amino acids in size and have a similar primary structure [13, 14] (Figure 1b). The crystal structure of sheep COX-1 (minus the post-translationally cleaved signal peptide), was obtained in 1994 ; human and mouse COXs have since been crystallized and show strikingly similar features [16, 17]. After the signal peptide, the amino terminus of the protein contains a single epidermal growth factor (EGF) module with conserved disulfide bonds that functions as a dimerization domain. This is followed by a series of four amphipathic helices that anchors the protein to one leaflet of the membrane. This 'monotopic' type of insertion into a membrane has been found only in this enzyme and a few other proteins such as squalene cyclase and S-mandelate dehydrogenase [18, 19]. The remainder of the protein consists of the catalytic domain, which has two distinct cyclooxygenase and peroxidase active sites. COXs are highly conserved, and few significant differences are seen in the dimerization, membrane-binding and catalytic domains between COXs from different species. The amino-terminal hydrophobic signal peptides differ significantly in length between species. In the case of two splice variants of canine COX-1, the signal peptide has been found not to be cleaved from the enzyme when expressed in insect cells . The catalytic domain contains conserved alpha-helical structures and a heme-binding motif shared with other peroxidases . COXs are glycosylated on asparagine in all organisms. One N-glycosylation site (Asn143, using the numbering of human COX-1) is absolutely conserved, and other sites are shifted only slightly in different homologs. For example, Asn410 in sheep COX-1 (orthologous to Asn4O9 in human COX-1), found to be essential for folding , is shifted to Asn394 in coral COXs. The cyclooxygenase active site is a narrow tunnel, approximately 8 Å wide and 25 Å long, that opens in the membrane-binding domain (Figure 2). This site accepts the arachidonic acid that is liberated from the membrane by cellular phospholipases. Amino acids lining this site are largely hydrophobic and serve to 'solvate' the hydrophobic substrate into the site . Exceptions to this hydrophobicity are Arg119, Tyr384 and Ser529 (numbered according to the human COX-1 enzyme sequence). Arg119 coordinates the carboxyl group of arachidonic acid by a salt bridge or hydrogen bond; Ser529 coordinates the geometry of attack in the complex bis-dioxygenation reaction performed; and Tyr384 forms a critical tyrosyl radical that initiates the cyclooxygenase reaction by abstraction of hydrogen from arachidonic acid (see Mechanism section). Non-steroidal anti-inflammatory drugs (NSAIDs) competitively inhibit the cyclooxygenase active site; an exception is the NSAID aspirin, which covalently modifies the enzyme by acetylating Ser529. In contrast to the cyclooxygenase active site, the peroxidase site is a solvent accessible cleft located on the surface of the enzyme furthest from the membrane (Figure 2). Cross-section of a cyclooxygenase monomer in the lumen of the endoplasmic reticulum, showing the two distinct catalytic sites. Cx, cyclooxygenase catalytic site; Mb, membrane-binding domain; Px, peroxidase catalytic site. COX-1 is ubiquitously and constitutively expressed in mammalian tissues and cells, whereas COX-2 is highly inducible and is generally present in mammalian tissues at very low levels, unless increased by one of many types of stimuli such as cytokines and growth factors. Both COXs are largely located on the lumenal side of the endoplasmic reticulum (ER) membrane and the nuclear envelope, although they have also been detected in some situations in lipid bodies, mitochondria, filamentous structures, vesicles and in the nucleus [23–26]. The lumen of the ER is important for both the structure and function of COXs: its oxidative potential allows formation of the disulfide bonds of the enzymes, and N-linked glycosylation - which occurs in the ER - appears to be necessary for proper protein folding . Moreover, the final product of COXs, prostaglandin H2, is sufficiently non-polar to diffuse through the membrane of the ER to isomerases located on the cytosolic surface of the ER or in the cytosol (Figures 2, 3). Lipid bodies may provide a similar environment, but the role of COXs in the nucleus is unknown. 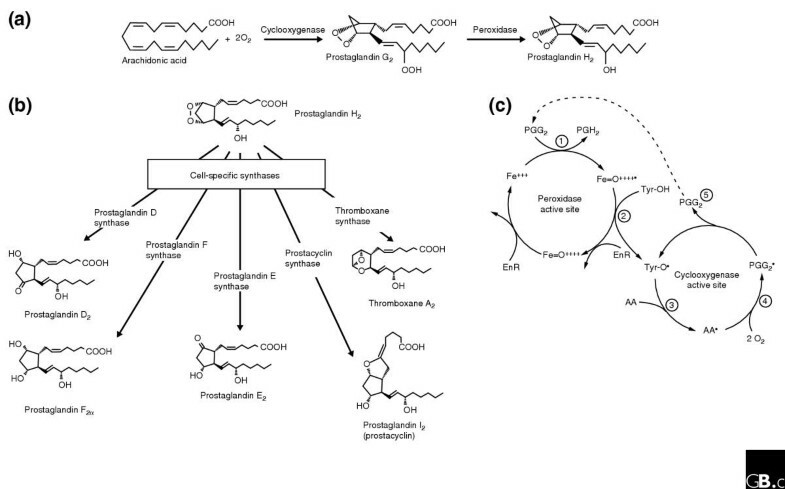 Production of prostaglandins by COXs. (a) The two reactions performed by cyclooxygenases: the conversion of arachidonic acid to prostaglandin G2 by the cyclooxygenase activity and the conversion of prostaglandin G2 to prostaglandin H2 by the peroxidase activity. (b) The cell-specific synthases that are involved in the conversion of prostaglandin H2 to the five principal prostaglandins. (c) The reaction mechanism of COX-1. (1) First, a ferryl-oxo (FeIV) protoporphyrin radical in the heme in the peroxidase active site is produced when endogenous oxidant(s) oxidizes ferric heme (FeIII) to ferryl-oxo (FeIV) protoporphyrin radical through a two-electron oxidation. (2) The Tyr384 residue in the cyclooxygenase active site is activated, through a single-electron reduction reaction with the FeIV protoporphyrin radical, to produce a tyrosyl radical. In the first step of the oxygenation process (3), the 13-pro(S) hydrogen of arachidonic acid in the COX site is abstracted by the tyrosyl radical to produce the arachidonyl radical. (4) This is followed by the reaction of the arachidonyl radical with two molecules of oxygen, to yield prostaglandin G2. (5) Prostaglandin G2 then diffuses (dotted line) to the peroxidase active site and is reduced to prostaglandin H2 by the peroxidase activity (1). AA, arachidonic acid; EnR, an endogenous reductant; Fe+++, ferric heme; Fe=O ++++, Ferryl-oxo FeIV porphyrin radical; Tyr-OH, active site tyrosine; Tyr-O, tyrosyl radical. Both classes of COX are bifunctional enzymes with two distinct catalytic activities: cyclooxygenase (or bis-dioxygenase) activity and peroxidase activity (Figure 3a). The primary products of COXs were first detected in human seminal fluid by clinicians studying uterine contraction . Thought to be the product of the prostate gland, these highly potent bioactive compounds were given the name prostaglandins. They are synthesized in virtually all tissues in vertebrates, however, and some organisms that lack prostate glands, such as corals, also synthesize prostaglandins. Thus, in many respects the term prostaglandin is a misnomer. Initially, the enzyme activity that synthesized prostaglandins was frequently called prostaglandin synthetase, but because it does not require ATP it is now called prostaglandin G/H synthase to fit the nomenclature convention. It is more popularly known as cyclooxygenase, a name that only partially describes the enzyme since it refers to only one of its two enzymatic activities. Prostaglandin isomers - including thromboxane and prostaglandins D2, E2, F2α, and I2 (prostacyclin; Figure 3b) - function in numerous physiological and pathophysiological processes, such as pyresis (fever), algesia (sensitivity to pain), inflammation, thrombosis, parturition, mitogenesis, vasodilation and vasoconstriction, ovulation, and renal function. Prostaglandin isomers act upon G-protein-coupled receptors , and there are multiple receptors for some isoforms (such as prostaglandin E2). Prostaglandins are short-lived in vivo (with half-lives of seconds to minutes), and act in an autocrine or a paracrine rather than an endocrine fashion. COX-1 was first studied in tissue and cell homogenates, and in this context was shown by Vane  to be the inhibitory target of NSAIDs. The cyclooxygenase activity of COXs oxygenates arachidonic acid to produce prostaglandin G2, a cyclopentane hydroperoxy endoperoxide; the peroxidase activity of COXs then reduces this to prostaglandin H2 (Figure 3a). The two reactions are functionally interconnected (see below and Figure 3c). A branch-chain reaction mechanism for COX, indicating that the two reaction cycles are coupled, was first proposed by Ruf and colleagues . The mechanism by which arachidonic acid is converted to prostaglandin H2 has been the subject of excellent reviews [31, 32]. The newly synthesized COX enzyme needs to be activated at Tyr384 (in human COX-1; Tyr371 in human COX-2) to produce a tyrosyl radical; this activation involves the heme in the peroxidase site (see Figure 3b). The tyrosyl radical converts arachidonic acid to an arachidonyl radical, which reacts with two molecules of oxygen to yield prostaglandin G2 This then diffuses to the peroxidase site and is reduced to prostaglandin H2 by the peroxidase activity. The cyclooxygenase activity is dependent on heme oxidation - that is, on the peroxidase activity - but continuous peroxidase activity is not necessary for cyclooxygenase activity, as the tyrosyl radical is regenerated in each catalytic cycle (Figure 3c). 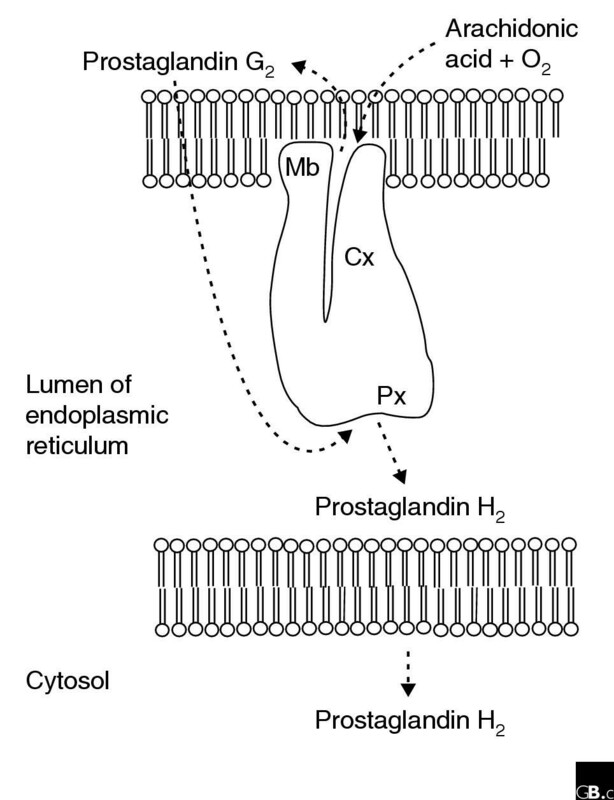 Prostaglandin H2 is the root prostaglandin from which prostaglandin isomers such as thromboxane and prostacyclin are made by downstream synthases, via isomerization and oxidation or reduction reactions (Figure 3b). Cyclooxygenases have short catalytic life spans (frequently 1-2 minutes at Vmax in vitro) because the enzyme is autoinactivated. The mechanism of autoinactivation is unknown, but reactive tyrosyl radicals may cause internal protein modification. The exact distinct functions of COX-1 and COX-2 are still being unraveled . There is increasing evidence for the involvement of COXs in the development and progression of cancer, Alzheimer's disease and other pathophysiological states. Development of therapeutic and diagnostic tools to treat these diseases is being actively investigated. Moreover, variants of cyclooxygenase derived from alternative splicing have been reported (reviewed in [13, 34]). Elucidation of the roles played by these variants could provide greater insight into the roles of COXs in physiology and disease. This work was supported by National Institute of Health grant AR 46688 and Merck, USA. We wish to thank K.L.T. Roos, D. Melville and C. Gurney for helping us in numerous ways.